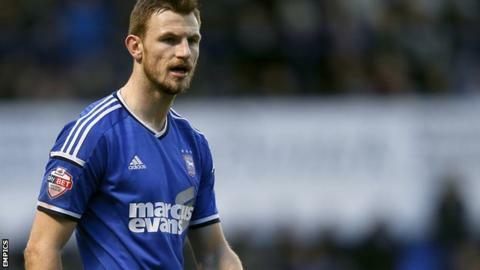 Ipswich registered their first league win of the season with a narrow victory over Sheffield Wednesday. After an exciting opening, Ross Wallace finished well to put the Owls ahead, only for Freddie Sears to equalise less than two minutes later with a fine shot from a difficult angle. The hosts took the lead after the break when Tommy Smith forced the ball home after a Ryan Fraser centre. Wednesday pushed for an equaliser but Town managed to see the game out. The Owls, who had won both of their first two matches, started brightly and almost took the lead inside five minutes when Marco Matias saw a shot come back off the post. The hosts responded well and last season's top scorer Daryl Murphy had a header cleared off the line after a corner before the Owls opened the scoring against the run of play in the 19th minute. Wallace thumped home after a quick counter-attack ended with a Matias cutback breaking into his path. The lead was short-lived as Sears latched on to a through ball and finished expertly from a tight angle. The hosts dominated much of the play for the rest of the half but had to wait until the 53rd minute to take the lead, Smith bundling home after Owls keeper Keiren Westwood failed to deal with a Fraser cross. It remained that way as Ipswich, who conceded two goals in stoppage time last week to draw 2-2 at Brentford, were indebted to keeper Bartosz Bialkowski for a fine late save from Lucas Joao. Ipswich manager Mick McCarthy: "Near the end I'm sure my heart was going a little faster than it should, but we were bound to be a little nervy. "I think it was a good performance. We had to come from behind to beat a very good team, which means we showed all the attributes you need to be a success in this league. "There were were some great performances and I thought Freddie Sears was outstanding." Sheffield Wednesday manager Carlos Carvalhal: "I am unhappy about the result but I am proud of my players, who fought for the whole 96 minutes, and also our fans, who supported the team during and after the match. "We knew this would be one of the hardest matches in the Championship but in some parts we controlled the game and we put Ipswich under pressure in the last 15 minutes. "But my players are learning and if this was played in three months time it would be a different test." Attempt missed. Lucas João (Sheffield Wednesday) header from the right side of the six yard box is high and wide to the left. Assisted by Álex López with a cross following a corner. Attempt saved. Lucas João (Sheffield Wednesday) right footed shot from outside the box is saved in the bottom right corner. Assisted by Kieran Lee. Corner, Sheffield Wednesday. Conceded by Brett Pitman. Attempt missed. Brett Pitman (Ipswich Town) right footed shot from outside the box is high and wide to the right. Assisted by Daryl Murphy with a cross. Corner, Ipswich Town. Conceded by Kieran Lee. Attempt blocked. Christophe Berra (Ipswich Town) header from the right side of the six yard box is blocked. Assisted by Brett Pitman with a cross. Substitution, Ipswich Town. Giles Coke replaces Jonathan Douglas. Corner, Ipswich Town. Conceded by Jack Hunt. Brett Pitman (Ipswich Town) wins a free kick on the left wing. Attempt blocked. Jack Hunt (Sheffield Wednesday) right footed shot from the right side of the box is blocked. Assisted by Ross Wallace. Attempt blocked. Freddie Sears (Ipswich Town) left footed shot from outside the box is blocked. Assisted by David McGoldrick. Substitution, Ipswich Town. David McGoldrick replaces Ryan Fraser. Attempt saved. Ross Wallace (Sheffield Wednesday) right footed shot from the right side of the six yard box is saved in the top right corner. Assisted by Jack Hunt. Corner, Sheffield Wednesday. Conceded by Tommy Smith. Álex López (Sheffield Wednesday) is shown the yellow card. Ryan Fraser (Ipswich Town) is shown the yellow card for a bad foul. Foul by Ryan Fraser (Ipswich Town). Corner, Ipswich Town. Conceded by Joe Wildsmith. Attempt missed. Freddie Sears (Ipswich Town) right footed shot from outside the box is high and wide to the right. Assisted by Cole Skuse following a set piece situation. Attempt missed. Ryan Fraser (Ipswich Town) right footed shot from the centre of the box misses to the left. Assisted by Freddie Sears.